A very complicated situation successfully resolved by ORS. A box manufacturer owned a small site of 0.9 acres (only part of the site in picture A). They wished to purchase a 12 acre site with an agricultural building of 23,000 sq. ft. in order to move, the problem being 0.9 acres of land would not generate sufficient cash to purchase B. The balance of land in picture A was owned by other individuals. This site was in an Area of Restraint and had a long history of residential refusals. ORS brokered a deal for the owner of site A to receive a percentage of the proceeds for the land they did not own if planning consent was granted for the total site of 3.5 acres. In the meantime ORS purchased site B unconditionally with only an agricultural consent, whilst the owners of site A, 0.9 acres, applied for planning consent (B2) to purchase site from ORS and move their business if B2 consent was granted. Whilst this was recommended, the Committee refused the application. The appeal was won with full costs awarded against the Council. 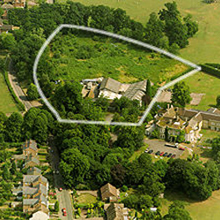 ORS subsequently negotiated a residential consent on the 3.5 acres. The site was sold to Bewick Homes for 10 large detached houses and with the proceeds from the sale the box manufacturer purchased site B from ORS who had held the property for over a year.